The 'super blue blood moon' is ocurring after more than a quarter of a century. Even as you read this, a rare phenomenon is taking place in the skies. The 'super blue blood moon' can be observed from many parts of the world - including north India - after more than a quarter of a century. The super blue blood moon will combine the blue moon, super moon, and total eclipse, all three being rare events. Because of this, the moon will appear red in colour as it crosses into the shadow of the Earth. The last super blue blood moon was reportedly seen on December 30, 1982. Predictably, the rarity of this event has led to many excited people looking out for the super blue blood moon. 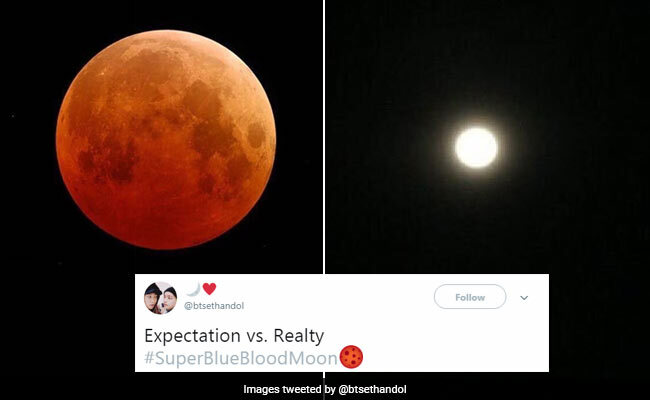 On Twitter, excited netizens are tweeting about the red moon. Who call them Eclipse predictors and not Grahan Bell? Went to terrace to view the lunar eclipse, came back as the only celestial view available was that of next door thaatha's patta patti underwear put out to dry. "I have given you #SuperBloodBlueMoon. Something that the previous administration couldn't give. MAKING MOON GREAT AGAIN"
A "blue moon" is the term used when the full moon appears twice in less than 28 days, as it takes the moon 28 days to revolve the Earth. A blue moon happens on average just under every three years. The reddish tint - which gives it the name 'blood moon' - happens due to "the effect of all the sunrises and sunsets all around the planet reflecting off the moon", said NASA astrophysicist Michelle Thaller.